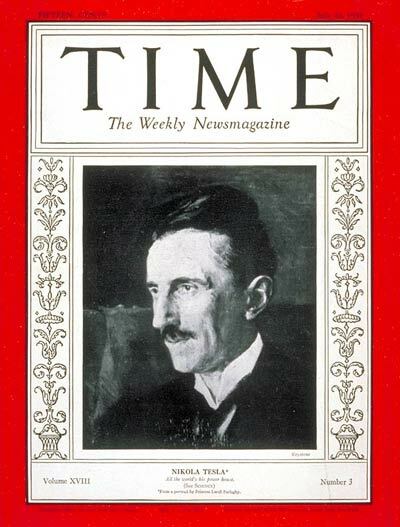 English: Time magazine, Volume 18 Issue 3, July 20, 1931 The cover shows Nikola Tesla. Аўтар Image of Tesla: Keystone. Rest of cover: TIME Magazine. The copyrights of Time magazine are held by Time, Inc. Copyright was not renewed on this early issue, which has therefore fallen into the public domain per US law. The following issues of Time magazine are in the public domain. Time failed to renew the copyrights of many early issues. A search of the renewals for periodicals for entries for Time reveals that the publisher, Time Inc., started renewing the copyrights of Time magazine in 1962 with the 29 January 1934, issue. Therefore, issues that were published before 29 January 1934 are in the public domain. In addition, a few later issues were not renewed. The copyright on this issue of Time magazine was not renewed and it is in the public domain.